On the hunt for the best ironing board to help you get those chores done in a timely fashion? Some of us love it, most of us loathe it, but ironing is a necessary evil that we mostly can't escape. The best thing to make ironing as quick and hassle-free as possible, other than having a decent iron, is to invest in a good quality ironing board that will let you zip through that pile of laundry in no time at all. Find tips on how to do laundry to get the most from your wash; and don't miss our laundry hacks for all the shortcuts you need. Head to our cleaning section for all things washing machines, tumble dryers and much, much more. The last thing you want is to end up having a fight with an ironing board that won’t stay up, or one that squeaks with every minuscule movement, and if you’ve got a small home then making room for one is another battle in itself. Most ironing boards will come with a tray to place your iron on, and fold down easily for convenient storage. If you have kids running about, check if the board you want has a child lock, as this will stop it from accidentally collapsing during use. When you're buying an ironing board on online, don't just assume it's the standard size; some ironing boards are made for small space living. Nothing wrong with that unless it arrives and is more child-sized that you expected. If you’re really short on space, then table top ironing boards allow you to utilise space you already have (plus you can sit down while doing it). Smaller, occasional ironing jobs will be fine done on a basic board, but if its suits and shirts you’re wanting to press on a regular basis, a wider board will allow for better coverage and accuracy. Wall-mounted ironing boards are an option for utility cupboards or spare rooms. You can also opt for ironing boards with additional features such as a hanging rack, a flex holder and sleeve attachments to make ironing a breeze. 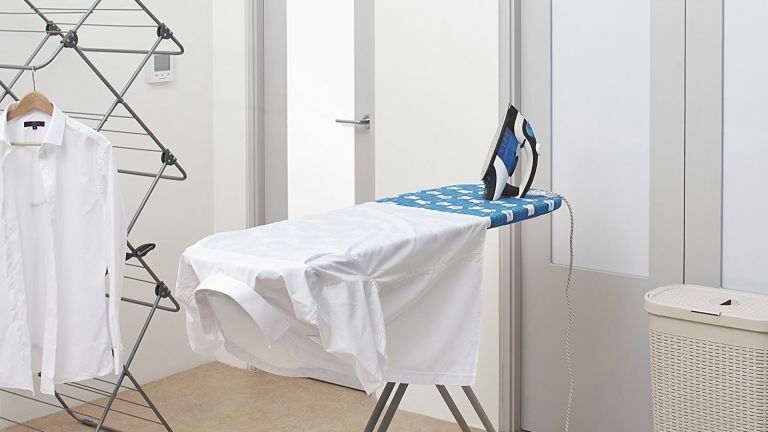 Steam generator irons can be hefty things, which is why having a strong and sturdy ironing board is required to hold it. This ironing board has been specifically designed with this in mind, and has a large enough tray table to hold the iron and its generator for quick and easy ironing. It also features a drip tray and works to reduce condensed steam and drips on clothing. For those who have little ones, you can have peace of mind the board is secured with a child safety lock, so no accidents can happen. Just remember to empty the drip tray before folding away otherwise you’ll have extra mess to deal with. In our opinion, this is the best ironing board you can buy. This ergonomic board is said to provide complete comfort when ironing. It is spacious and designed with safety in mind, including a flex guide to stop the iron cord from tangling, a wide tray to keep the iron stable. Customers have said this board is bigger than expected, so you’d need a dedicated utility space to really make use of its ergonomic design, but overall it is sturdy and easy to clean with a removable board cover. If you’re sick of your home looking like a launderette all the time, then this fold away version is the best ironing board for you. It is wall mounted, so it can be fixed inside a utility cupboard or somewhere else discreet and its swivel mechanism allows a 180 degree range so you can lock it left or right depending on your home and what’s comfortable for you. It doesn’t have a tray table which means it might not be ideal for large steam generator irons, but for smaller, basic irons this board provides plenty of space. This ultra-light board is designed for popping up at a moment’s notice and features and thermos-reflection cover which allows for faster, more efficient ironing. The board itself is fairly narrow, so it’s better for smaller items of clothing and occasional use, and if you’re short on space, then this board can be easily stored out of the way at a weight of just 3.3kg. The height is also adjustable for comfort and a safety lock ensures it won’t unexpectedly jump out at you in the middle of the night; all in all, this is a reliable ironing board for everyday use and our pick of the best ironing board for quick jobs. Ironing shirts can be a real pain, and you end up spending more time moving the garment around than getting the creases out. However, with this ironing board, you can expect a much wider worktop which makes ironing shirts and suit jackets really easy. This ironing board is said to be incredibly sturdy with rubber feat that ensure it doesn’t wobble when in use, and customers love how easy it is to adjust the height so no hunching over is required when using this board. It doesn’t have a tray table but it does have a designated heat resistant end which allows you to have peace of mind that the iron is safe when not in use. Square edges make it easy to iron shirts and, well, everything! Ever thought the pointed end of an ironing board was more of a hindrance than anything else? This square-edged ironing board may make your life a whole lot easier. The wide board will allow for clothing, especially shirts, to be ironed with ease and with less need to manoeuvre them about the board. The anti-slip feet make this a great choice for hardwood floors, but If you’ve got a large steam generator you’ll need a stable surface nearby as this doesn’t have a try to accommodate an iron. In our opinion, this is the best ironing board for shirts. For quick and convenient ironing, this table top board is the best ironing board to choose. If you’re short on space then you can simply place this on top of your dining table or a flat work surface to create a makeshift ironing board. Users have said it takes a little getting used to, and it can be tricky to iron larger items of clothing, but for quick jobs it works very well and its lightweight body makes it easy to store and move around when necessary.